Home from the County Fair, this Norman Rockwell painting, appeared on the cover of The Literary Digest published August 14, 1920. The alternate title for this work is Father and Children in Carriage. In 1920 alone, the Digest featured Rockwell artwork on the cover nine times total. 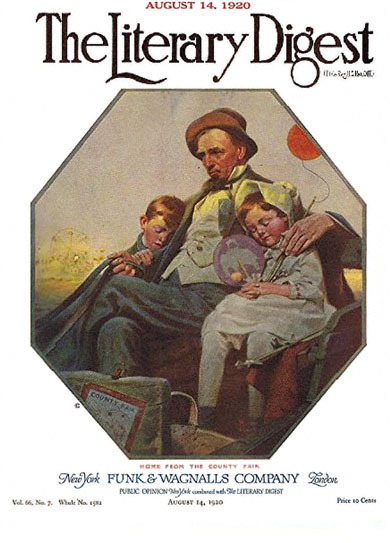 This illustration was Rockwell's seventeenth picture overall featured on the cover of The Literary Digest. This painting also appears on page 52 of Norman Rockwell, A Definitive Catalogue by Laurie Norton Moffatt. Norman Rockwell loved painting children. He also loved depicting family scenes from everyday life. Sometimes he painted humorous situations, sometimes not. Here is a "not". Home from the County Fair was only one of 47 Norman Rockwell Literary Digest covers; here is the list of more Norman Rockwell Literary Digest scans. In this illustration, we see two sleeping children. They are exhausted and asleep on each of their father's shoulders. The little girl has a balloon on a stick and string that trails the family on their trip home. They are riding in a horse-drawn carriage. Note the reins in Father's hand. All three are no doubt exhausted from a time at the County Fair. We see the Ferris wheel in the background. No doubt also whether their stomachs are full of cotton candy and candy apples. August was when the county fair circuit started in the northern United States where Rockwell was based. This painting was topical to the time of year.